Ask ten people what a scooter is, and you will probably get ten different answers. While there is not a precise definition of a scooter to most people, there certainly is in the eyes of the law -- and this definition often means the difference between having and not having to purchase insurance coverage. What is Considered a Moped? If your scooter has two wheels, an engine that is smaller than 50 cubic centimeters, and can’t travel more than 30 miles per hour, then it is probably a moped. Some of these vehicles may have pedals that are helped along by the power of a motor, and in New Jersey and Nebraska, this is a defining characteristic of all mopeds. Other states may also include slow vehicles with small engines that have a platform for your feet and require the motor to do all of the work. What Is Considered a Scooter? For insurance purposes, a scooter and a moped are one and the same. Any vehicle that can reach speeds of over 30 miles per hour and has an engine larger than 50 cubic centimeters is considered a motorcycle––whether you consider it one or not. Do I Have to Purchase Insurance for My Motorcycle? In almost every state, you will have to have motorcycle insurance to operate it on public roads. The only states in which this isn’t the case are Florida, Montana, New Hampshire, and Washington. What About My Fast Motor Scooter? You might consider your fast little ride a scooter, but if it can go over 30 miles per hour or it has an engine larger than 50 cubic centimeters, then in the eyes of the law, it is a motorcycle, not a scooter. The only exception to this rule is Nebraska: there, a scooter must have pedals, and anything without them is classified as a motorcycle. Do I Have to Purchase Insurance for My Motor Scooter? You will need to purchase liability coverage if you own a motor scooter in Alabama, Alaska, Arizona, California, Colorado, Illinois, Iowa, Louisiana, Maine, Maryland, Minnesota, Mississippi, New Jersey, New York, North Carolina, Pennsylvania, Rhode Island, South Dakota, Texas, Utah, Vermont, Washington, D.C., West Virginia, or Wisconsin. You will be obligated to purchase liability coverage if you own a motor scooter in Arkansas, Connecticut, Delaware, Florida, Georgia, Hawaii, Idaho, Indiana, Kansas, Kentucky, Massachusetts, Michigan, Missouri, Montana, Nevada, New Hampshire, New Mexico, Ohio, Oklahoma, Oregon, South Carolina, Tennessee, Virginia, Washington, or Wyoming. If your scooter has pedals, then you won’t need to purchase coverage in Nebraska––but if it does not, you will. I Live In a State That Does Not Require Insurance for Scooters. Are There Any Exceptions? As you probably anticipated, there are several exceptions to this rule. If you took out a loan to pay for your scooter, you could guarantee that you will need to purchase insurance. When you’re spending someone else’s money, they are going to want to make sure their asset is protected. Even if you paid for your scooter, insurance is generally a good thing to consider. For one, if your scooter is totaled, you won’t be able to be repaid for the damage if you do not have insurance. But more importantly, if you cause harm to someone else’s person or property, you will be on the hook for the total amount if you do not have insurance. Where Can I Buy Scooter Insurance? 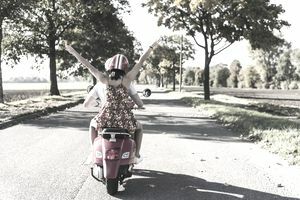 If the idea of asking your insurance agent about scooter insurance makes you grimace, you will feel much happier knowing that scooters are typically insured under a motorcycle insurance policy. Most nationwide insurance providers offer motorcycle coverage, and you will often be able to bundle your scooter and car insurance policies for a discount. What Type of Scooter Insurance Coverage is Available? In addition to property damage liability protection, most insurance options come standard with bodily injury protection as well––that is the “BI” half of Bodily injury & property damage liability (BI/PD) coverage. You can also choose to get comprehensive and collision coverage, which will cover the costs of repairing or replacing a damaged or stolen vehicle once you have paid your deductible. You can also elect to purchase coverage for your carried contents and belongings as well, just in case they are damaged or stolen during your time scooting around town.